Mutations in this gene have been associated with autism and polydactyly in humans. ↑ Crawford MJ, Lanctôt C, Tremblay JJ, Jenkins N, Gilbert D, Copeland N, Beatty B, Drouin J (1997). "Human and murine PTX1/Ptx1 gene maps to the region for Treacher Collins syndrome". 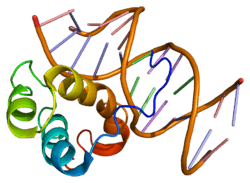 Mammalian Genome. 8 (11): 841–5. doi:10.1007/s003359900589. PMID 9337397. ↑ Shang J, Li X, Ring HZ, Clayton DA, Francke U (Feb 1997). "Backfoot, a novel homeobox gene, maps to human chromosome 5 (BFT) and mouse chromosome 13 (Bft)". Genomics. 40 (1): 108–13. doi:10.1006/geno.1996.4558. PMID 9070926. 1 2 "Entrez Gene: PITX1 paired-like homeodomain transcription factor 1". ↑ Philippi A, Tores F, Carayol J, Rousseau F, Letexier M, Roschmann E, Lindenbaum P, Benajjou A, Fontaine K, Vazart C, Gesnouin P, Brooks P, Hager J (2007). "Association of autism with polymorphisms in the paired-like homeodomain transcription factor 1 (PITX1) on chromosome 5q31: a candidate gene analysis". BMC Medical Genetics. 8: 74. doi:10.1186/1471-2350-8-74. PMC 2222245 . PMID 18053270. ↑ Klopocki E, Kähler C, Foulds N, Shah H, Joseph B, Vogel H, Lüttgen S, Bald R, Besoke R, Held K, Mundlos S, Kurth I (Jun 2012). "Deletions in PITX1 cause a spectrum of lower-limb malformations including mirror-image polydactyly". European Journal of Human Genetics. 20 (6): 705–8. doi:10.1038/ejhg.2011.264. PMID 22258522. ↑ Szeto DP, Ryan AK, O'Connell SM, Rosenfeld MG (Jul 1996). "P-OTX: a PIT-1-interacting homeodomain factor expressed during anterior pituitary gland development". Proceedings of the National Academy of Sciences of the United States of America. 93 (15): 7706–10. doi:10.1073/pnas.93.15.7706. PMC 38811 . PMID 8755540. Szeto DP, Ryan AK, O'Connell SM, Rosenfeld MG (Jul 1996). "P-OTX: a PIT-1-interacting homeodomain factor expressed during anterior pituitary gland development". Proceedings of the National Academy of Sciences of the United States of America. 93 (15): 7706–10. doi:10.1073/pnas.93.15.7706. PMC 38811 . PMID 8755540. Shang J, Luo Y, Clayton DA (Jun 1997). "Backfoot is a novel homeobox gene expressed in the mesenchyme of developing hind limb". Developmental Dynamics. 209 (2): 242–53. doi:10.1002/(SICI)1097-0177(199706)209:2<242::AID-AJA10>3.0.CO;2-0. PMID 9186059. Poulin G, Turgeon B, Drouin J (Nov 1997). "NeuroD1/beta2 contributes to cell-specific transcription of the proopiomelanocortin gene". Molecular and Cellular Biology. 17 (11): 6673–82. doi:10.1128/mcb.17.11.6673. PMC 232521 . PMID 9343431. Tremblay JJ, Drouin J (Apr 1999). "Egr-1 is a downstream effector of GnRH and synergizes by direct interaction with Ptx1 and SF-1 to enhance luteinizing hormone beta gene transcription". Molecular and Cellular Biology. 19 (4): 2567–76. doi:10.1128/mcb.19.4.2567. PMC 84049 . PMID 10082522. Tremblay JJ, Marcil A, Gauthier Y, Drouin J (Jun 1999). "Ptx1 regulates SF-1 activity by an interaction that mimics the role of the ligand-binding domain". The EMBO Journal. 18 (12): 3431–41. doi:10.1093/emboj/18.12.3431. PMC 1171422 . PMID 10369682. Pellegrini-Bouiller I, Manrique C, Gunz G, Grino M, Zamora AJ, Figarella-Branger D, Grisoli F, Jaquet P, Enjalbert A (Jun 1999). "Expression of the members of the Ptx family of transcription factors in human pituitary adenomas". The Journal of Clinical Endocrinology and Metabolism. 84 (6): 2212–20. doi:10.1210/jc.84.6.2212. PMID 10372733. Tahara S, Kurotani R, Sanno N, Takumi I, Yoshimura S, Osamura RY, Teramoto A (Oct 2000). "Expression of pituitary homeo box 1 (Ptx1) in human non-neoplastic pituitaries and pituitary adenomas". Modern Pathology. 13 (10): 1097–108. doi:10.1038/modpathol.3880204. PMID 11048804. Quentien MH, Manfroid I, Moncet D, Gunz G, Muller M, Grino M, Enjalbert A, Pellegrini I (Nov 2002). "Pitx factors are involved in basal and hormone-regulated activity of the human prolactin promoter". The Journal of Biological Chemistry. 277 (46): 44408–16. doi:10.1074/jbc.M207824200. PMID 12223489. Ghosh AK, Majumder M, Steele R, Ray R, Ray RB (Feb 2003). "Modulation of interferon expression by hepatitis C virus NS5A protein and human homeodomain protein PTX1". Virology. 306 (1): 51–9. doi:10.1016/S0042-6822(02)00029-6. PMID 12620797. Hiroi N, Kino T, Bassett M, Rainey WE, Phung M, Abu-Asab M, Fojo T, Briata P, Chrousos GP, Bornstein SR (May 2003). "Pituitary homeobox factor 1, a novel transcription factor in the adrenal regulating steroid 11beta-hydroxylase". Hormone and Metabolic Research = Hormon- Und Stoffwechselforschung = Hormones Et Métabolisme. 35 (5): 273–8. doi:10.1055/s-2003-41301. PMID 12915995. Kolfschoten IG, van Leeuwen B, Berns K, Mullenders J, Beijersbergen RL, Bernards R, Voorhoeve PM, Agami R (Jun 2005). "A genetic screen identifies PITX1 as a suppressor of RAS activity and tumorigenicity". Cell. 121 (6): 849–58. doi:10.1016/j.cell.2005.04.017. PMID 15960973. Lord RV, Brabender J, Wickramasinghe K, DeMeester SR, Holscher A, Schneider PM, Danenberg PV, DeMeester TR (Nov 2005). "Increased CDX2 and decreased PITX1 homeobox gene expression in Barrett's esophagus and Barrett's-associated adenocarcinoma". Surgery. 138 (5): 924–31. doi:10.1016/j.surg.2005.05.007. PMID 16291394. Picard C, Azeddine B, Moldovan F, Martel-Pelletier J, Moreau A (Sep 2007). "New emerging role of pitx1 transcription factor in osteoarthritis pathogenesis". Clinical Orthopaedics and Related Research. 462: 59–66. doi:10.1097/BLO.0b013e3180d09d9c. PMID 17549029. Qi DL, Ohhira T, Fujisaki C, Inoue T, Ohta T, Osaki M, Ohshiro E, Seko T, Aoki S, Oshimura M, Kugoh H (Apr 2011). "Identification of PITX1 as a TERT suppressor gene located on human chromosome 5". Molecular and Cellular Biology. 31 (8): 1624–36. doi:10.1128/MCB.00470-10. PMC 3126332 . PMID 21300782.